It's almost frustrating—All the new rounds are the same as the old rounds, and its hard to see the progress. 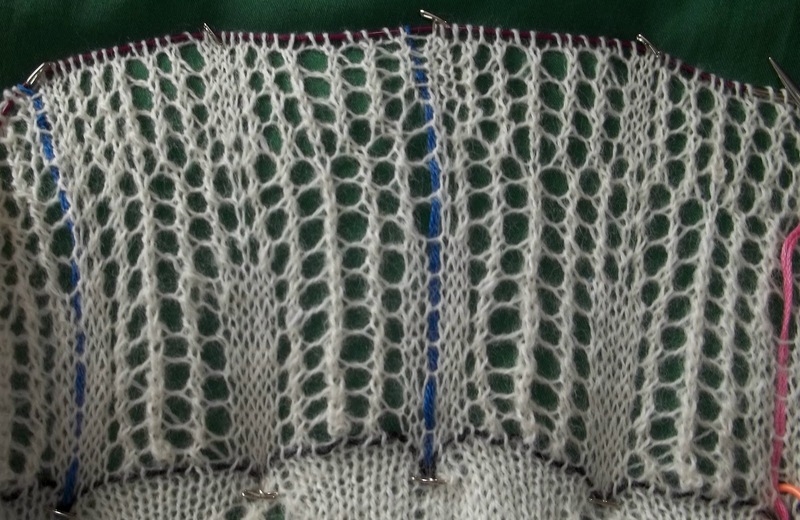 But 6 more rounds, and a columns that had 4 eyelets has become one that has 7 --Look at the columns of stocking knit between the motifs.... First the column has 5 knit stitches, then for a while a single knit stitch, now it has 3 knit stitches. The total count from the lifeline (beginning of chart 4) is 34 round. I am counting the eyelet stitches along side the 3 knit stitch bit—Still 34 rounds of a 87 round chart done—means I am more than 1/3rd done—and quickly nearing half done with this final chart! So 4 more rounds, (2 plain, 2 fancy) and then another increase and the beginning of the base of the feather eye—and clearly visible change and progress. The possibility of adding more rounds at the top of the feather motif exist—and when I get there—well I can think about it between now and then! Gently stretched (by hand) and crudely measured, the shawl is 50 inches in diameter now—A WET blocking would increase that by another 5 to 10 inches—and I still have another 5 inches of so of knitting to do. 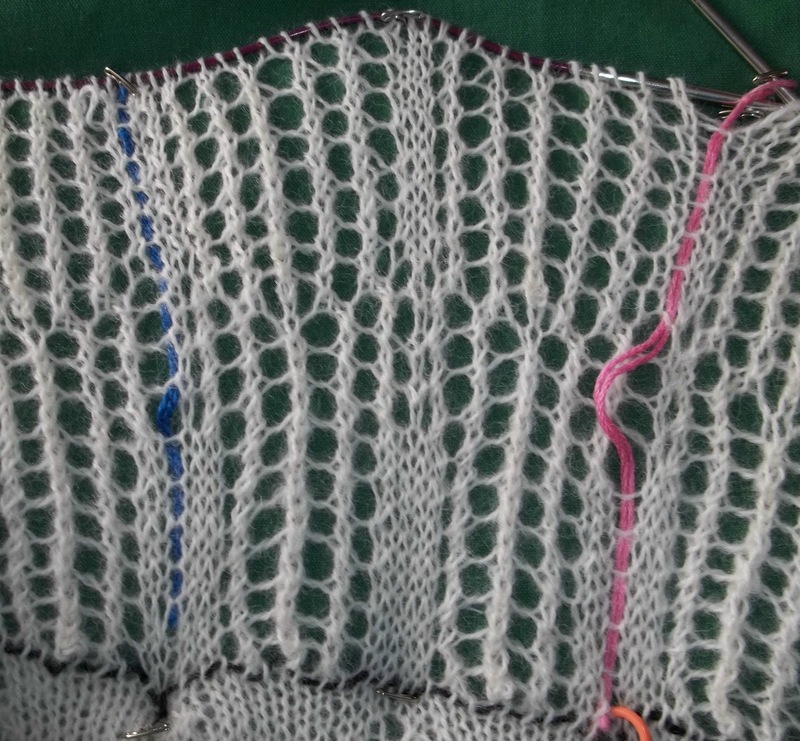 This will finish out close to the 74inches (almost 2m--1.8m or so) that most of the other examples of the shawl are. I am still holding off on starting any other project—but that will change this week—2 pot holders are coming—each will take a single evening—so they are not big distractions. I have some other chores to do, too, and this week is supposed to be cooler, and damper (rain is in the forecast –everyday—which may not pan out) but it will be a good week to catch up on things. How much progress you make, when you just DO IT! 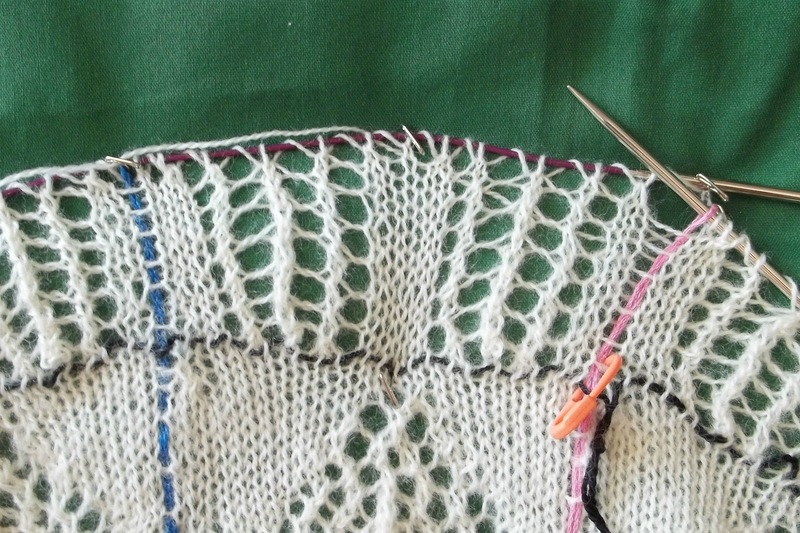 A few more rounds added to the shawl—and the urge to start something else (anything else!) has be avoided. There are still 60 more round or so to do—what with the chart, the end rounds and binding off. I have 60 days or so, but there will be more hot days—when I won't want to knit, and there is a ton of sewing to do. Already, the stem portion of this last round of feather motifs are taller than any previous set of feathers, and there are still several more rounds of stem before the eye of the feather gets started. 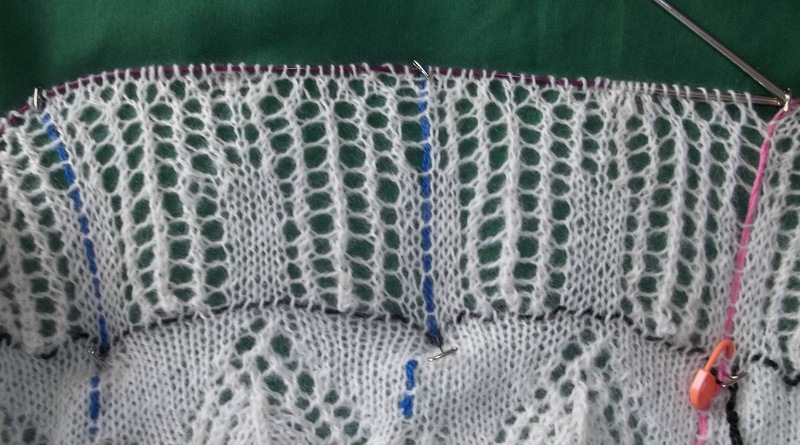 Its the easy part—round after round of the same lace, round after round of the same 840 stitches. The good news is: It's easy knitting. The bad news is: It gets boring. As much as I don't look forward to rounds of 1500 stitches, those rounds are lively—each round is different, each round really adds to the pattern. As for sewing, there is mock up of my dress, and the final version, a mock of a bridal coat, and bridal coat, too—4 big projects! And I haven't the fabric for any of them! The mock ups will need some simple fabrics something cheap- and simple. The final dress? Some fine stuff, and a matching lining and trim. The coat? Well I have (enough I think) some fine white wool—but the velvet for the collar? And the lining? (but the bride hasn't approved the white wool—and made noises about satin—So there is that, too—finding time to meet with her, and shop! Another 10 round have been knit, and another set of increases. Count per round is 840—and will hold steady at that for then next 20 rounds or so (22 rounds as per the chart, but I am cheating and reducing the count by a pair (one charted round/one plain round. June's socks were presented to Tracy on Tuesday—and were (happily for both of us!) a perfect fit. She slipped off her strappy sandles and wore the socks all evening as she knit. 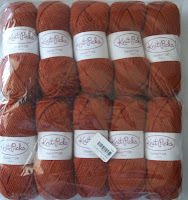 Sometime in the weeks to come—I get to blog about the new (to me) sock yarn that she has promised to add to my stash. I think about starting sock.. My goal was to make 24 pairs of socks this year, 12 public and 12 secret—and at this point—with just a week left to the month of July, 3 pairs behind. No secret socks for June, and no socks at all for July! But I have 70 or so rounds of the shawl to finish—and with each round taking the better part of an hour (and longer and more time consuming rounds to come—that's 70 hours of work to do. For now, socks will have to wait. I want to make more progress on the shawl before I start any other projects. I really love how it looks, and I think the finished result will be stunning-- but I have to finish! I am sure there are some skeptics out there, but it seems evident—there is, climate change. The US is experiencing HOT, HOT weather. There are droughts, and super storms. Its been bad in northeast—but its been worse in other parts of US. When the weather is hot, (over 90°/3x°C) and humid, and the air quality is bad (it used to get a lot worse, but it still gets bad)--All I want to do is sit in the pool, or pool side in the shade and vegetate. I've done that a lot this summer. Its not yet August—usually the worst of the summer months) and we've already had 3 heat waves (Defined as: (per weather service) 3 or more days of + 90°. The first heat wave was back in May, and we've had 3 in July. Its Hot. Too damn hot. I do my best to keep cool, but I don't sleep well, and the heat saps all my energy. But the weather broke on Wednesday—HUGE thunderstorms, lots of rain, and I caught up on some cleaning (I haven't been cleaning either!) and I caught up on some knitting. Look! Here it is mid July, and I have finally finished Junes (first pair!) of socks. I didn't use every last yard of yarn (I rarely do) but these socks are taller than average. On the other hand, the foot is slightly shorter (by a half inch) and the circumference is a bit smaller. They fits LEGS better than my average sock –since my average sock is knit for me—and my feet are bigger and my calves fuller. But these socks aren't for me. One day soon, my Tuesday night knitting will meet again—minor illness as well as the heat has caused several cancellations—and these socks will be swapped for some sock yarn. Tracy is house cleaning too—and reducing her stash. 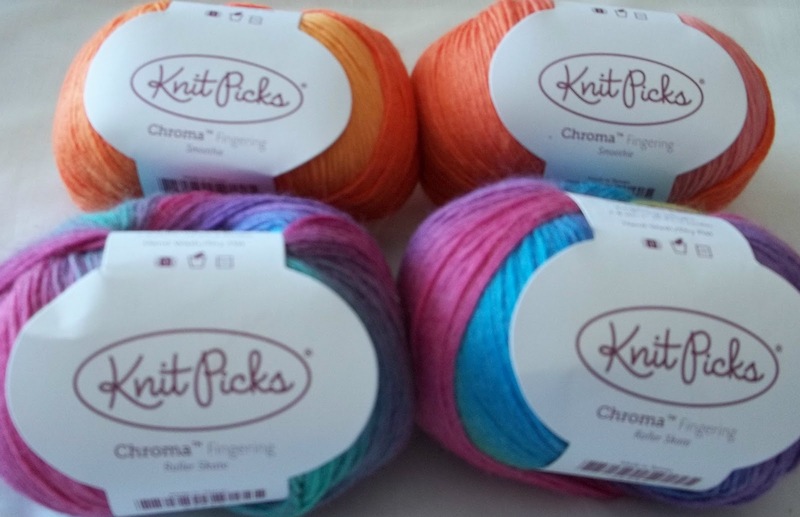 Some sock yarns are coming my way. For years Tracy has asked for socks (she knits and she crochets—just not socks) and this pair is made for her. 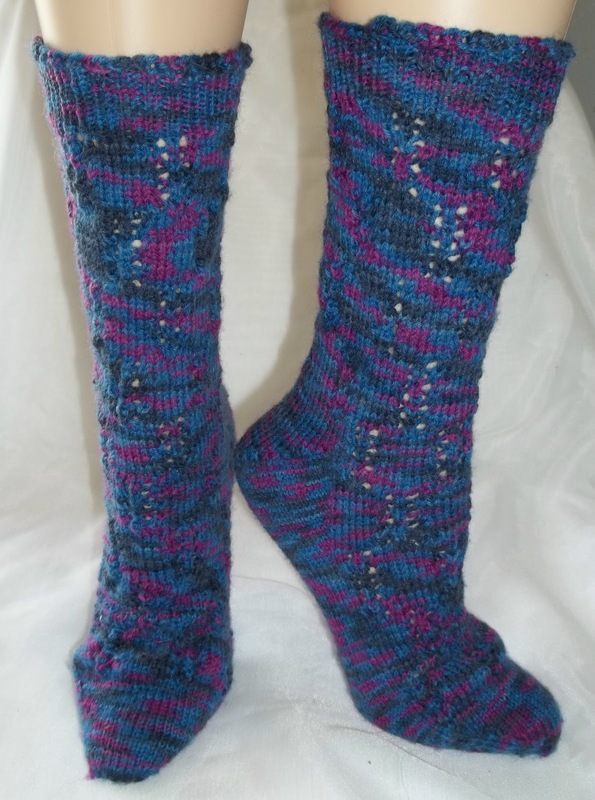 Tracy didn't ask for a swap—she was just being generous—but how could I not knit her a pair of socks? 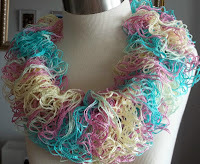 I finished the loopy, lacy knit necklace (a title my daughter thinks is a more appropriate for this) It's going to be given away. And I've finished (bound off, and wove in tails) of this scarf, too, that's been a WIP for months—waiting to be bound off and finished! I am thinking of adding a crosswise border-- But not right now. At least it is bound off and the needle is free. Peacock Shawl has been languishing too, but I have to get cracking. (one round (a plain one) has been added. My daughter's wedding shower is the first week of August, and it's just weeks from then till the wedding—I have to finish the shawl, (knitting) paint and block it, AND get my dress made. Plus I have committed to make a wedding coat for my daughter, too! 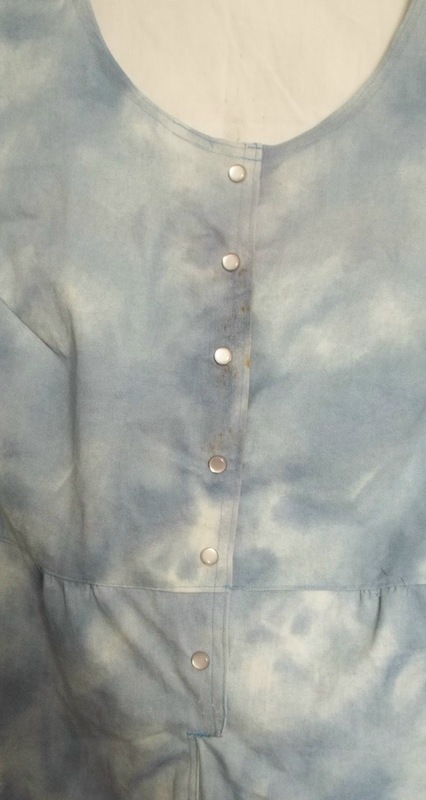 Both the dress and coat will require samples first--the sample coat will end up being a warm bathrobe—made of cotton and lined with flannel—vs the real coat of white wool lined in satin. I have finally quit (for the moment) sewing for myself—and while the work I did reduced my stash of fabric—most of it has been replenished. Come the fall, I will need some heavier, (warmer) darker skirts—and while the brown, the brick, the red, and the plum are a start, there is also some denim (what's a wardrobe with a denim skirt or two, or more!?) and a piece of black—I am enough of a NY'er that I NEED at least 1 black skirt—besides, I have a half dozen pairs of socks that are partially black—I need black clothes to wear with the socks! I haven't been successful in losing more weight (I have to be honest—I haven't been making an effort) but I haven't gained back any of the weight I've lost-- so most of my old cloths are way to big and I will need to sew up more new ones—I have a half dozen skirts, and 3 jumper dresses.... but I need more clothes than that! I have to clean closets, too and get rid of all those clothes that don't fit. Not much—not a full repeat on the lace pattern of the sock (still a few rounds short)--still its looking more sock like (and less anklet like) with every round. 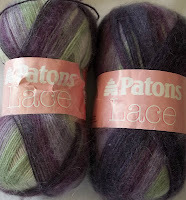 I still have lots of yarn--these might end up being boot high (about 12 inches of leg) socks. And just a few rounds of the shawl (up to round 15—which is more than it sounds, since last time I posted, my count was wrong—I had only completed 10 (not 12 rounds of chart 4)--there are 2 chart repeats between each marker (blue thread)--the black yarn is the lifeline at the end of chart 3. Here I am 48 hours later with a new summer scarf appearing. 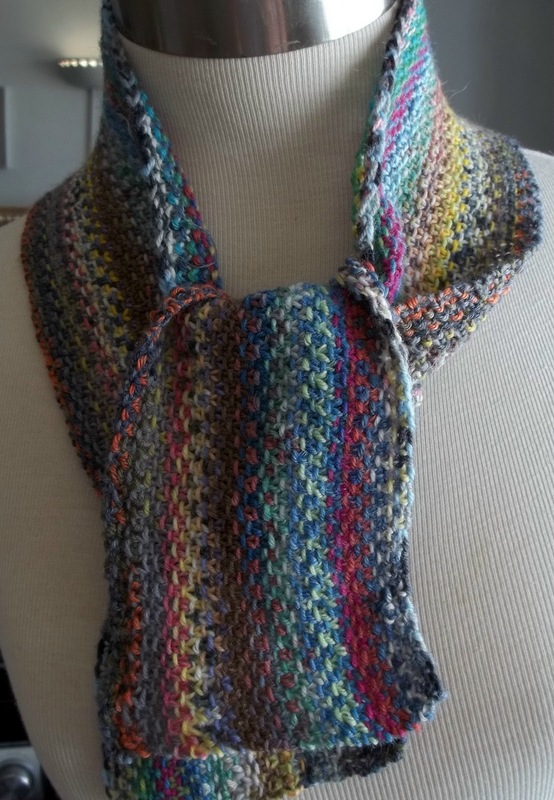 It's a bulky texture yarn, but not a fast knit. 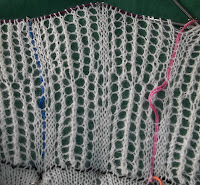 I am using size 8 needles, (the pattern suggested a size 7) But opening (and untwisting) the lacy tape is time consuming. And the scarf is a bit heavy (though it doesn't look it!) It does look light and lacy and fun-- and well, fun it is! 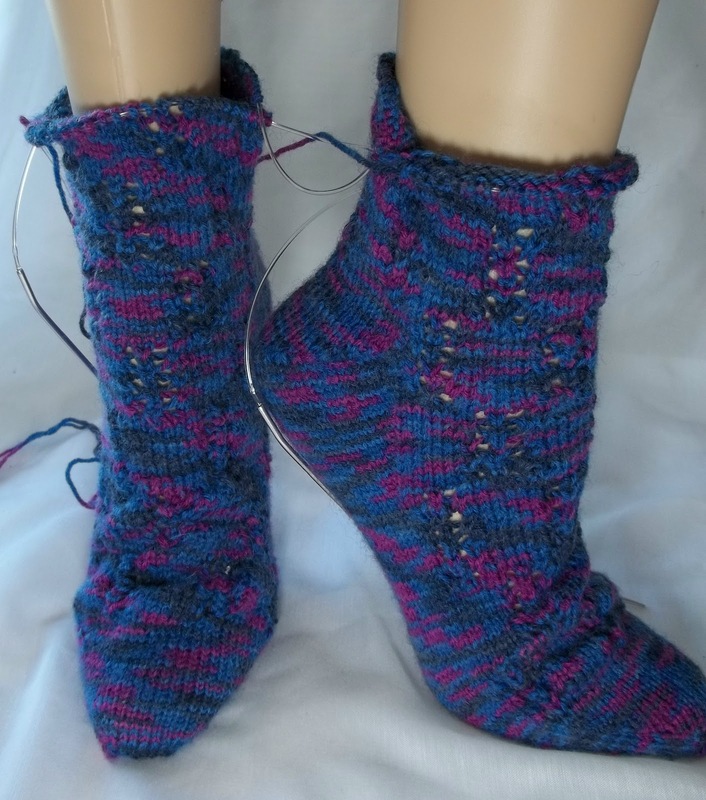 June's sock has an inch added to it—a complete lace pattern repeat of 10 rounds. It still need another half dozen inches knit before it can be considered done, but considering that it hasn't had so much as a round knit in a week, an inch is good progress. The heat continues—this is the 3rd heat wave (defined as 3 days in a row of Plus 90° (32°c) temps)--this season! We don't usually have heat waves like this till the dog days of summer—that is, in August. By the way did you know why the dog days? It comes from the appearance of Sirius(the dog star) from the dog constellation in the evening sky—which happens in late July or early August (in this corner of North America). A front will move in late Saturday night—the weather will break and the days will be warm (mid 80° (high 20°C) with less humidity, and cooler nights. Last night at 11PM it was still in the high 80's—too hot to sleep—the fans do nothing but push the hot air around. And the air too saturated to absorb any more moisture, so you just lie in a puddle of sweat—Ugh! 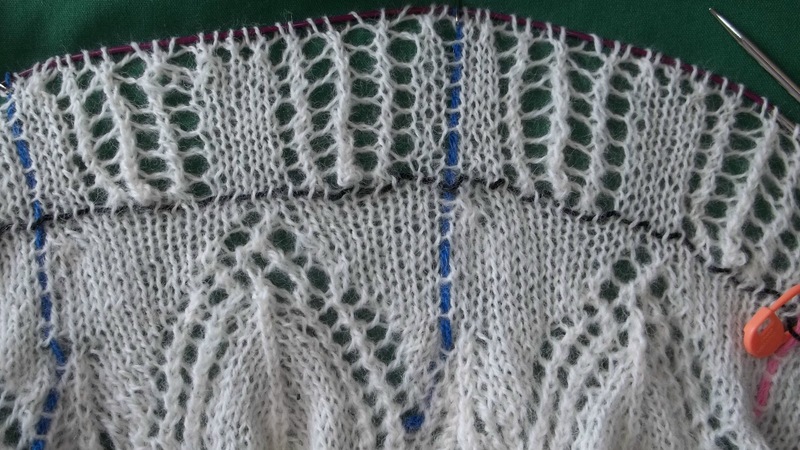 I'll wait till there is some more visible progress-on both the socks and shawl to take a photo—likely tomorrow. It's about time! I started June's sock late—and here it is 1/6th of the way into July, and June's first pair of sock—toe up blue lace socks are just getting to being half finished. 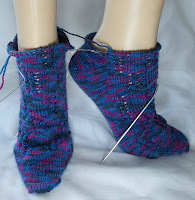 I had started working on the heels (the increase part) before I stopped knitting and spend most of June sewing. Then last night I finished the increases, and finished up the the short rows to complete the heel. This AM I did a few more rounds—Plain in the back, continued pattern in front, and now the back of the sock is tall enough that with a new pattern repeat about to start, the pattern will continue round the sock—both front and back. They are slightly smaller than my average sock (cause these socks aren't—like 99% of the socks I knit—for me) and fit LEGS nicely. Now all that remains is a straight run to cuff. I like Paton's Kroy socks—all the different varieties (I think I have them all, and in every color, with some doubles!) 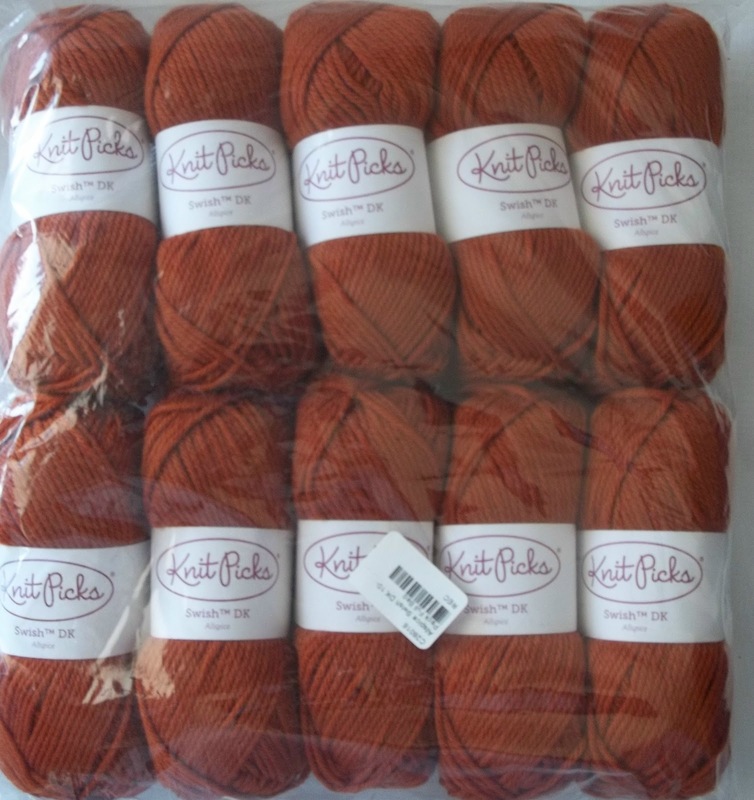 but a 50g skein is only 165 yards--(vs say the Chroma I showcased yesterday (396 yds per 100g/198 yds per 50g,) or Lion Brands Sock Ease(438 yd per 100g/219 yds per 50 g)--it's a rather small skein. So with slightly less yardage, there is a finite limit to how tall these socks will be—Not that they will be short—I just checked on the scale, I still have a full 50 g. left (of the combined skeins) so there is enough yarn left for a full pair of socks—I won't end up with anklets! My limited knowledge of Celsius system is based on a few landmarks—0°C= 32°F, (freezing point of water) 16°C=61°F, (inverted symmetry) 37°=98.6° (body temp) 100°= 212° (boiling point of water). It's not perfect and complete knowledge—but enough for a reasonable gauge (I can read C measurement when traveling and have a clue—the best days are warmer than 16°--but not so hot as 37°) Every once in awhile, I google a site to get exact exchanges... but most often I just approximate. Yards/meters are close enough for the most part—That it rarely matters (I do have (for sewing) a METER stick—but I still call it a yard stick (well it has both systems (one per side) and I still tend to use the inches/yard side—but in theory, I could measure meters! My “quick” jumper has taken me 5 days to complete and to be quite honest, it could use a final pressing that it's not going to get in this heat! The last bits—it seems the last bits are always the hardest— are done. Now, mind you, the jumper is a pull over dress—sleeveless with a scoop neck. It doesn't need an additional opening to be put on or taken off. The idea for a front opening with snaps was a purely decorative detail. OK, I had some white enemaled snaps--(found at a clearance sale sometime in the past)--and I thought they would be great—Problem was—they were way to heavy—they need several more layers of fabric to fill in the space between the front cover and working end of the snap. These heavy duty snaps went together like a 2 part rivet. I found some white plastic snaps.. about the right size—and though these too were labeled “heavy weight” they were clearly lighter. In fact almost every snap I found, (7/16th, ½ inch and ¾ inch) were labeled heavy weight—but really they were “OK for twill or duck cloth, OK for denim and OK for heavy outwear”---The smallest sized one (3/8th ) were a bit too small,(and the only ones not labeled heavy duty)-- the biggest, too big. Eventually I found the perfect snap—the 7/16th size—with mother of pearl heads. Too bad there wasn't a setting tool. I bought them—sans tool. At home—setting the snaps was a bit of detail work. First step was lining up the snaps---Unlike buttons that are easy to reposition, snaps need to be done right the first time. I went with “french tacks” (Long pieces of thread sewn through both layers at once, then you gently pull the layers apart and cut the thread—leaving half of the threads in layer 1, and the other half in layer 2. The french tacks were then replaced with a dot from a Sharpie—2 steps to get the positions of the snap pieces lined up perfectly. Then the second half of the snap (the working half) is balanced on the prongs, and topped with a spool—I have several old wooden spools—and the 2 pieces were hammered together (with out me smashing my thumb!) The prongs are pushed (and bent) into a groove on the working half--locking the 2 parts together. The spool is handy for one half of the snap (the female half) but vital for the male half—the center “stud” of the snap can sit in the hole of the spool. The hammer blows apply pressure on the outer edges of the snap to secure, with out mashing the center stud—and making it useless. Each snap took a half dozen blows from my 7 oz hammer before I felt they were secure. Repeat 5 more times for the front half of the dress, and 6 more times for the second half of the snap set. The second half of the snaps just have a pronged ring—not the fancy mother of pearl heads. In the end, the snaps are perfectly lined up—and the pearly snaps are just the right finish for this dress. They are classic for denim and country wear—and just the right detail. They are a PITA to do—but done, and done right they really make for a professional finish! My quick little jumper took more time than I planned, but I am very happy with the results. My DIL, Sonya, has been sewing too. What been different about the two of us is our INTENT. Now days, the customized details are different—like the newest jumper... The pattern is a Simplicity one (I hate their web site and can't find a way to link to it—it's pattern number 9890—a jumper (as we in the Americas know jumpers, i.e., a open neck, sleeveless pull on dress) and jacket. 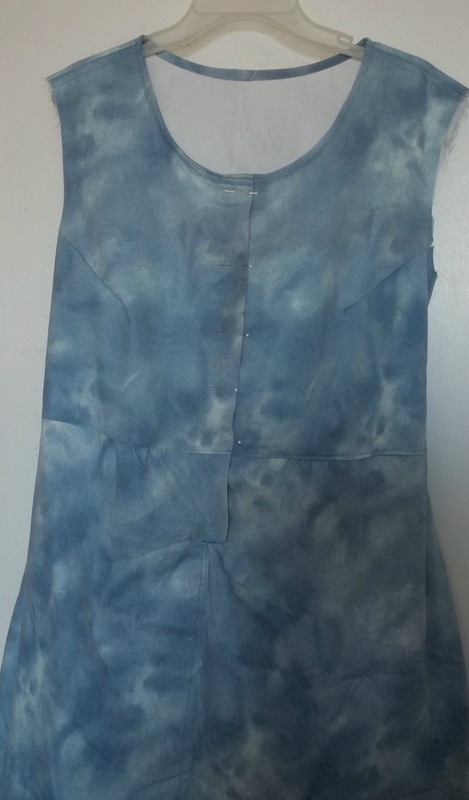 First time round, the only way I altered the pattern was to add pockets. I always want pockets, and always add if they are not included. Second time round, in a sparkley black linen, I changed the top by added a small placket and a 2 button closure. All three versions have the same inset side seam pockets—that almost goes with out saying! 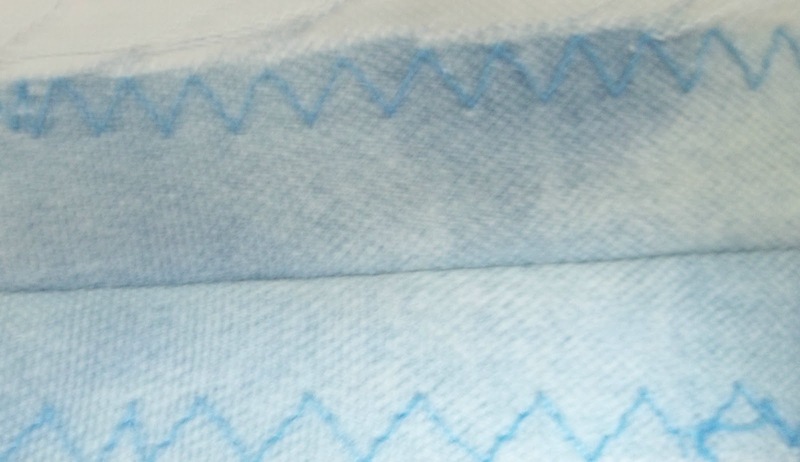 They are, all three, casual clothes (the linen is a bit dressy looking) and all three are nicely finished—with the seams over-sewn with a zig-zag stitches. My skirts, too, have nicely finish insides—I have always love that my clothes look almost as good inside out as out side in... It's a point of vanity with me. My DIL has nicely finished detail on her clothes, (as a sewer, I notice the lovely details in the binding!) and some pockets on dresses she has made are pieced to get the pattern just right... Her dresses are skillful made, with nice detailing. But more than the details, her INTENT is totally different. Her sewing is a work of ART-- the practical clothes that result, a mere side effect. Looking at the mere detail of our dresses.. there are many similarities. But our INTENTS are so different. My sewing is pure practicality—practiced with skill and attention to details. Her sewing has a practical outcome (new clothes) but it's all about the medium, the process and place. It's like children engaged in “parallel play”--at first-- it looks like we are doing the same thing (Sewing clothes) but look closer, and there is hardly any similarity at all. Still, I am happy for the small overlap of activity—I am happy being a crafty person who sometimes engages in a work of art (but more often than not, is just engaged in craft). And I am happy that Sonya find art in a very similar activity.